Spoilers for Unbreakable and Split follow, and it is advisable to see these both before Glass. It’s been 19 years since writer / director M. Night Shyamalan released Unbreakable, a grounded story about the awakening of a superhero which, for its time, was a fresh take on the mythology, and still holds up today as a great thriller. In Unbreakable David Dunn (Bruce Willis) is the sole survivor of a horrific train crash. He is contacted by comic book enthusiast Elijah Price aka “Mr Glass” (Samuel L. Jackson), who suffers from a rare condition that causes his bones to fracture ‘like glass’. Price helps Dunn accept his invulnerability, but it transpires that Price caused the crash as he’s been searching for someone at the other end of the spectrum of his physical ailment, and thus a superhero and supervillain are born. Fast forward to Split (2016), where three young women are captured by a man with multiple personality disorder and they must escape before one of the personalities, ‘the Beast’, surfaces and kills them. Split is a great psychological thriller with an exceptional performance from James McAvoy as the man who has many personalities that call themselves The Horde. At the end of the film it is revealed that it is set in the same universe as Unbreakable and thus a sequel was eagerly anticipated. In all honesty Shyamalan has had more misses than hits and early reviews for Glass have been less than positive, but overall I found it to be a good watch and a satisfying conclusion to the trilogy. Glass takes place three weeks after the events of Split, when Dunn is tracking down The Horde. Following a rescue and confrontation they are captured by psychologist, Dr. Ellie Staple (Sarah Paulson), and taken to a Psychiatric Hospital where Price has been residing for the past 19 years. Although all three films are connected this one feels more in tone like a comic book movie than the others, which isn’t surprising due to the mythology, generic traits and plot developments of comic book lore. However, at points it becomes a bit too meta and convoluted with geeky references, with over-explanation of some moments become slightly jarring, especially in its third act; but this is all part of its narrative. We have the welcome returns of Split’s sole survivor, Casey Cooke (Anya Taylor-Joy), Dunn’s son Joseph (Spencer Treat Clark) and Elijah’s Mother (Charlayne Woodard), and, as custom, Shyamalan makes a cameo appearance. Jackson and Willis are on fine form and thankfully not phoning in their performances for a quick buck (like we’ve seen too many times), but McAvoy once again steals the show with his performance, effortlessly transforming between personalities for which we see a few more than we did in Split. One of the best things about all of these films is the mystery and growing suspense. Not once did I drift off during Glass, but at the same time I found some elements to be a bit of a mess. Be it lack of logic in some scenes or convenient and predictable plot devices, but once it finished I was having trouble processing the finale; despite thoroughly enjoying the film as a whole. As it geared towards a predictable and climatic showdown it, of course, delivered something that was unexpected, which is no real surprise as it’s a M. Night Shyamalan film, and he is renowned for his plot twists. But if it would have played out and ended like most other superhero films it would have felt like a cop out, as these films are very much grounded in reality. It’s far from the worst ending that the trilogy could have had, but it was unconventional and gave us something we had rarely seen before on screen. It more importantly wraps up the character arcs of the main three characters. It was also great to see the hero and villains interact with each other in the hospital as Price’s mysterious plan comes to fruition. The film utilizes the score and various key shots from the previous two films along with an unused scene from Unbreakable to great effect, and really helps tie all three films together. Once again this is a Blumhouse production and looks great for its budget of $20 million. It manages to mix horror, comedy, thrills and mystery in a film that you have to see if you enjoyed the previous two, and I just hope the majority of audiences don’t dismiss the film or the entire trilogy on how this chapter ends. 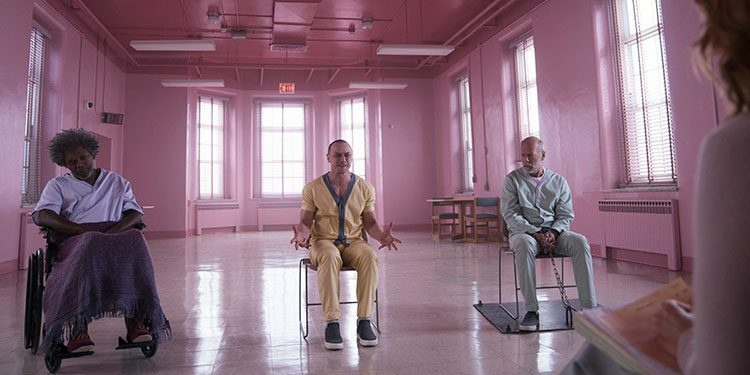 Overall Verdict: With some truly great moments and performances Glass is a satisfying finale to M. Night Shyamalan superhero trilogy, which has been influenced by and will influence many superhero films to come.